In week 2 we finally got to cooking something that we could take home. We practiced julienne cuts and were introduced to tomato concassé (con-ka-SAY). We also got into stock making and made a vegetable stock. The leek was our victim for practicing the julienne cut. We used the cut leeks to make a gratin that was oh so simple and delicious! It will likely become a staple comfort food for me this winter. With the tomato concassé, we made a Portuguese sauce. Concassé means peeled and seeded, so that’s exactly what this sauce is mostly comprised of – peeled, seeded tomatoes. It also has a bit of onion, garlic, basil and parsley. It is super light and really flavorful. Toss it over a bed of small pasta like ditalini, and you’ve got yourself a pretty good meal. 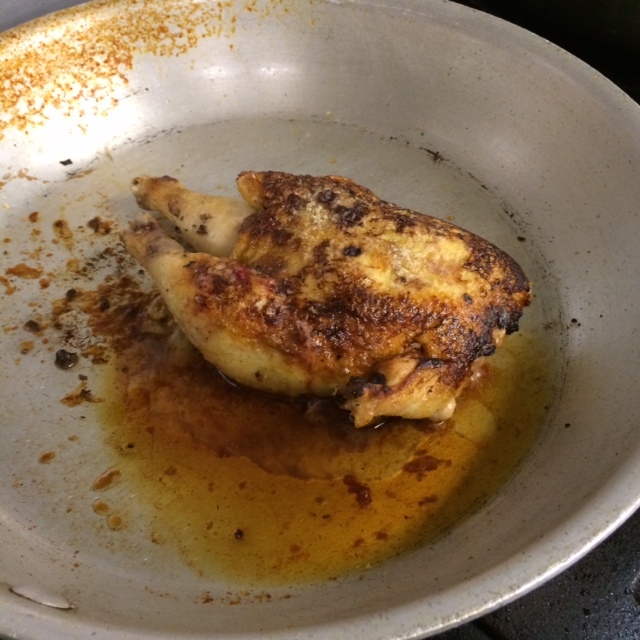 In week 3, things got serious – we glove boned a Cornish game hen. I haven’t worked with meat in over 5 years and even when I did cook with it, I wasn’t deboning anything, that’s for sure. So this was a totally new experience for me. Glove boning basically means you’re taking all of the interior bones out while keeping the meat and skin intact. Well, that’s the goal anyway. The birds were still slightly frozen which made it hard to get around in there, so I had to take a couple breaks to let my fingers thaw out. I was a bit grossed out by the experience, but I managed to get it done without mutilating the thing too badly. I didn’t particularly enjoy breaking its little wings and thighs, but that’s part of the deal, so I sucked it up and dug in. We stuffed the hens with mushroom duxelles (which is a pretty basic mixture of chopped mushrooms, shallots and parsley), pan-seared it for a few minutes on each side and finished it off in the oven. While the hens were in the oven, we moved on to cooking off some duck breasts. On every cooking show I’ve seen, they’re always talking about how important it is to get the skin cooked to a nice crisp and ensure that it’s seasoned well enough. I have never had a duck breast, let alone cooked one, but I have to say that I’d prefer it to glove boning Cornish hens. 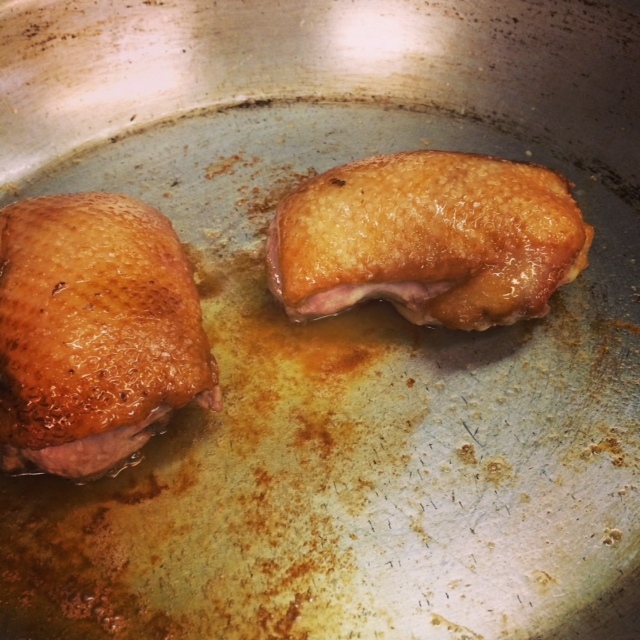 I tried a couple small pieces of the duck and understood right away why it is so popular – it was really good. I managed to get a good crisp on the skin and it was seasoned well enough (at least for my own preference). I also took a small taste of the hen, it tasted fine to me and I sent it home with one of my classmates. Charlie will be enjoying the rest of the duck with his dinner the next few nights – he will be one happy dog. Up next: breaking down flat and round fish!